Springtime is my favorite time of the year; I adore all the gorgeous flowers and the bright greens of the tree leaves. But there are two words that I really don’t care to even have whispered in my presence in April: “Spring Cleaning” — oops, I don’t think I even like to type it! Don’t misunderstand me…I love the end result of Spring Cleaning. It’s just all the work that comes BEFORE the end result that seems overwhelming to me. Just the other day I noticed our windows–oh, my! I know some real elbow grease is going to be involved there plus cleaning the screens. I suppose it all seems overwhelming because I work full-time, and Saturdays are my only days to clean. By the time I spend several Saturdays cleaning windows, vacuuming EVERYTHING, chasing cobwebs, and laundering curtains, etc…..I feel as if the summer is half gone. I can remember my maternal grandmother doing her Spring Cleaning. She was one of those ladies who changed her curtains and bed covers every six months. In the Fall, heavier curtains and bedspreads came out of storage and donned the windows and beds for the approaching cooler weather. In the Spring, the Fall items went into storage, and the Spring items came out. The curtains were laundered again (after being laundered before they went into storage), starched, ironed, and hung. Spring and Summer months also meant cotton slipcovers on the living room furniture as well as soft, lightweight bedspreads–usually in pastel colors. Mattresses and pillows were pulled from the beds and taken outside to bathe in the sun all day — with a watchful eye for possible approaching rain clouds. None of my grandparents ever had air-conditioned homes, and I can still vividly recall seeing clean, white curtains billowing at the windows as breezes ruffled their otherwise stillness. Yes, Spring Cleaning is a good thing. And just as we Spring Clean our physical homes, cleaning our mental homes is a good thing, too. 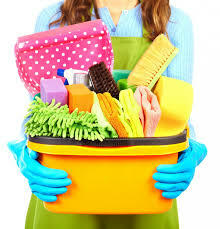 Except, for best results, the mental house-cleaning should be a daily privilege. I say “privilege” because it should not be considered a chore or a task. We should feel honored to be able to read the Word of God each day, to praise Him, to enter into His presence in prayer ANYTIME and ANYWHERE, and to have Someone to whom we can confess our sins, hurts, and fears. Allowing our Heavenly Father to cleanse our minds and souls, brush away the cobwebs of selfishness and conceit, adjust our attitudes, guide our paths, and comfort our hurts and sorrows is the very best Spring Cleaning available…..and it’s free! Hope your Spring Cleaning goes well.